PSF Wales Ltd, part of Morgan GRP and based on the same site as it’s sister company Morgan Marine Ltd, took the Security market by storm by offering the first available insulated construction. Our double skin steel building construction gives an exceptionally high insulation value making the housing energy efficient and helping to reduce carbon footprint whilst meeting all the security requirements. 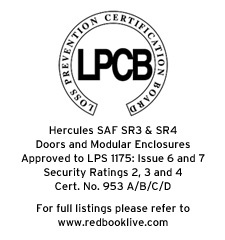 The hercules SAF comprehensive range of Security Enclosures will meet all your security requirements, tested and certified to LPS 1175 issue 6 and 7 it includes Security Rating SR2, SR3 and SR4. The enclosures are available as Single Skin un-insulated or Double Skin insulated to 0.6w/m²/°C as standard and offer complete flexibility in build size. 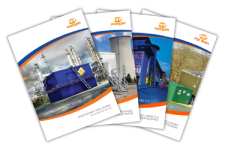 We are not limited to set sizes and design to suit individual requirements. The internal finish is fully lined which enables wall mounting of customers equipment, just advise us of the weight.